“Road Trip Home - A Baha'i Vision of Hope” by Steven E. Ellis is an inspiring and enlightening story about hope in the search for true purpose and the meaning of life. Tired of the rough, dark winters in Alaska, Grayson decides to move with his family to Oregon. This journey home will be over 3,000 miles and will take about ten days. They will be caravanning with another family. When an eighty-three-year-old Alaskan native named Rose approaches Grayson, he is intrigued with the offer she presents to him. Rose asks that she may ride with him in the truck, so that she can journey down to see her family, who live in the direction that he is heading. She also has a mission to fulfill from a prophecy that dates back to her childhood. Gifted with a profound spiritual truth to share with others, the only way Rose sees herself being able to do fulfill this mission is through Grayson. She will record their discussions about spirituality, religion, God, faith, politics, and science, and show him how it relates to the Baha’i belief system. These discussions will be material for a book that will enlighten those who read it. “Road Trip Home” is a beautifully written tribute to the Baha’i belief system. Having been interested in learning about the Baha’i beliefs, I was pleased to be able to have the opportunity to learn about it by reading a book that took me along on a spiritual journey. Reading it in this format gave it so much more meaning. As the character Rose shared her story, Grayson asked questions that most readers would want to ask. This enables the reader to learn through his experience. In addition to the spiritual journey, there are also website links that will connect those interested to more information about the Baha’i Community. There are is also a concise list of 21 Spiritual Principles for Modern Times. This list sums up much of the discussions throughout the book. 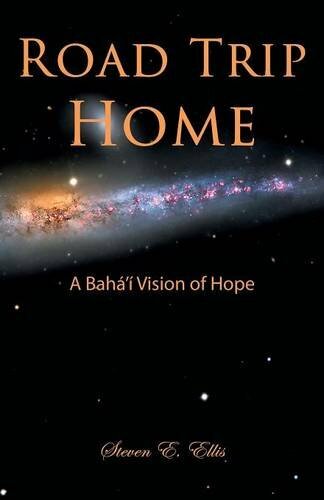 I highly recommend that people who are interested in the Baha’i Community read “Road Trip Home - A Baha'i Vision of Hope” by Steven E. Ellis. Readers who enjoy reading enlightening books that help them along their spiritual paths will also be pleased at the insight that gained in reading these pages.